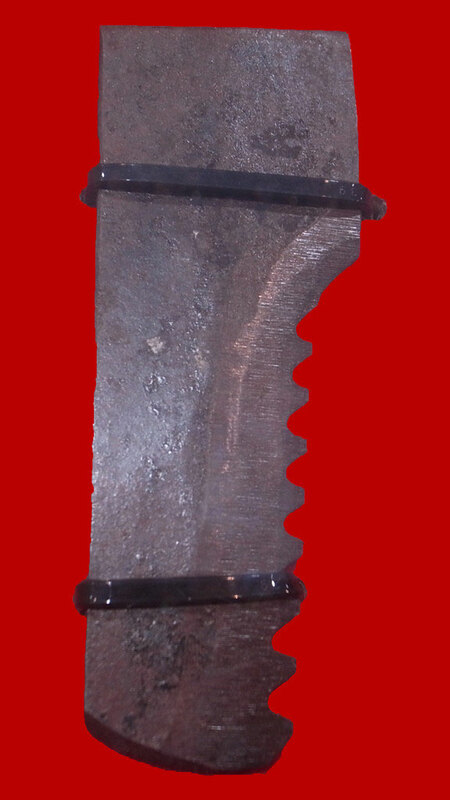 High-carbon steel that forms the edge of the blade which contains around 1% carbon (depending on the type of steel such as White #1 and White #2). The steel used here is Yasukihagane Aogami #2 which is also called Blue #2 Steel in common. The reverse side is sharpened to give it a wave—like pattern. This pattern is only for Blue Steels on the other hand White Steel does not have wave pattern and it is straight. And this pattern is called "Montan". The flexible ore becomes the base (less than 0.03% carbon). A mixture of boric acid, borax and iron oxide are used in between the hagane and jigane to assist in the forge welding, and it is hammered together at approximately 1,000℃ (1,832℉). The metal is formed into roughly the shape of a knife. The part that will enter the handle is hammered out. The biade is hammered out to the desired size and thickness. It is then cooled down slowly from 750℃ (1,382℉). By hanmmering oxidized iron is taken off from the side of the knife. The knife is roughly pounded by using a belt hammer. Using a grinder and a buffer, the hagane on the reverse side is smoothed down. 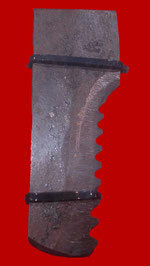 The blade is smoothed out even further using a belt hammer. A line is drawn showing the prescribed size, and excess parts are cut off. Shape is given using a grinder and belt sander etc. A thin clay/mud is spread on the blade, and once it is dried it is heated to 780℃ (1,436℉) then rapidly cooled in water (this is the hot process). Then temperature is increased approximately 170-180℃ (338-356℉) which increases durability and gives toughness (this is the hot process). Distortions will appear and these are fixed by hammering again.